Sam was asked to undergo a liver operation in Singapore which would cost him about S$50,000.00. Sam came to Penang instead and underwent an operation for his liver in a private hospital. This cost him RM 35,000.00. This operation was done in October 2008. There is ill-defined hypodense lesion at Segment VI. It measures 3.5 x 3.5 cm. Feature is suggestive of right lobe hepatoma. Liver tissue weighing 350 gm, measuring 140 x 120 x 60 mm. Diagnosis: hepatocellular carcinoma. After the surgery, Sam underwent two times of chemoembolization, in December 2008 and January 2009. Each treatment costs about RM 5,000.00. In February 2009, Sam suffered severe jaundice. The blood test results on 10 February 2009 is a below. Sam underwent another surgery to install a metallic stent in the upper common bile duct. This procedure costs RM 20,000.00. 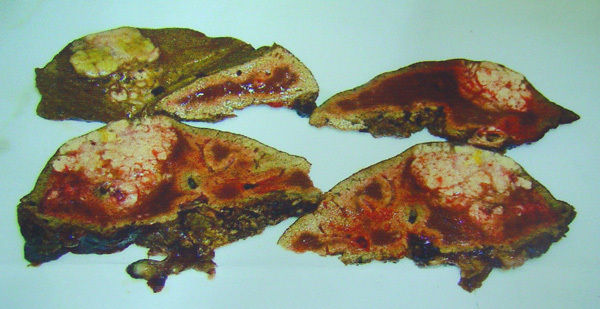 • Worsening of the liver with increase in the number and size of the liver nodules. • There was thrombosis of the adjacent portal vein extending partially to the main portal vein. In spite of such deterioration, nothing was done. And Sam was sent home without much explanation. Sam and his wife came back to Penang again in March 2009. Unfortunately this time, the surgeon who operated on Sam’s liver was rather “hostile” in his attitude. It was a complete change of the surgeon’s attitude from the previous time before Sam had the operation. Sam and his wife felt let down and cheated. Sam’s wife said that before the operation the surgeon even hugged her and assured her that Sam would be alright. Now, after the relapse he did not even want to talk to them. They also told us that surgeon insisted that Sam undergo the surgery immediately because it was a very serious case. Sam and his wife requested go home and think it over first. The surgeon told them that if they returned to Indonesia, there would be a delay and by that time Sam’s condition would have deteriorated and he (the surgeon) would not be able to perform the surgery any more. Sam and his wife were virtually coerced into making their decision. Listen to this video conversation. Chris: You came to Penang – what did they say? Sam: I had to be operated. C: Before you did the operation, did you ask the doctor if surgery would cure you? S: It must be removed. Wife: Otherwise the cancer will increase more and more. C: That is not true! Oh, you came here and they say cut and you agreed to get cut? W: If we don’t operate, it is going to be dangerous. So, okay we agreed to the operation. C: Let me ask you one more thing. Before you came here, before the operation – what was your condition? Were you healthy? S: I was alright – healthy. C: And after the operation, and having spent RM 35,000.00 – were you better? W: Before the operation, the surgeon was very friendly to us. He talked to us very nicely. C: Oh, before the operation, Ibu (mama) asked anything and the doctor would answer you? He was nice to you? W: Yes, he answered our questions and was very nice. But after the operation, he did not want to say anything anymore. We wanted to consult him but he did not want to talk to us. When we asked him questions, he just walked away. In a rush he just said – No problem, no problem and left us. S: No, we were not able to talk to them like this (with you). C: Before the operation, he talked to you nicely? W: Yes, correct, correct. He even hugged me and assured me – Don’t worry, don’t’ worry, he (my husband) would be well and alright. S: Oh, he was so sweet. W: We felt so good and comforted. He told us the operation has to be done immediately. S: It told him I was not prepared for it yet. The surgeon leaned back and sighed: Arr … if you don’t do it now, your condition will deteriorate. W: He said: I would not be able to operate you anymore. C: Wah, that is what he told you? If you go back to Pontianak first, your condition would get worse and you would probably be half dead? W: By that time, it would be difficult to help. C: That could not be true at all. S: We did not have other alternative. C: Yes, I fully understand. Patients are often rushed into making decisions. I don’t believe this is correct. Sometime, doing nothing is better than doing something. Sam then moved on to see another doctor who prescribed him two oral drugs. 1) Baraclude (entecevir) which is commonly prescribed for Hepatitis patients. 2) Nexavar – a drug that cost RM 20,000 per month. (Note: Pang in another story was also asked to take similar drug, which his doctor said was only 20 to 30% effective). • He felt tired when walking or even talking. • His chest felt tight. • His ear started to produce a humming sound throughout the day. • His sleep was disturbed. Sam and his wife came to seek our help on 8 March 2009 and decided to give up further medical treatment. 1. This is a very tragic story indeed. Professor Jane Plant wrote: Conventional cancer treatment can process patients to the extent that they no longer understand what is really being done to them. It started with a threat or instill of fear in patients. Your liver is rotten – if you don’t get it out it is going to kill you. And you must do it fast! And look what has become of Sam now? Dr. Richard Fleming (in Stop inflammation now) wrote: … all forms of surgery cannot provide a long-term cure because they do not deal with the underlying cause of the disease, which is inflammation … Surgery often triggers an even greater inflammatory process, which encourages the illness. 2. Sam handed us the reading of his alpha-fetoprotein (AFP) below. Study the above numbers carefully. Sam’s AFP value was only 3.0 before the gall bladder operation. After the operation, his AFP started to increase, from 50.5 to 3,201. 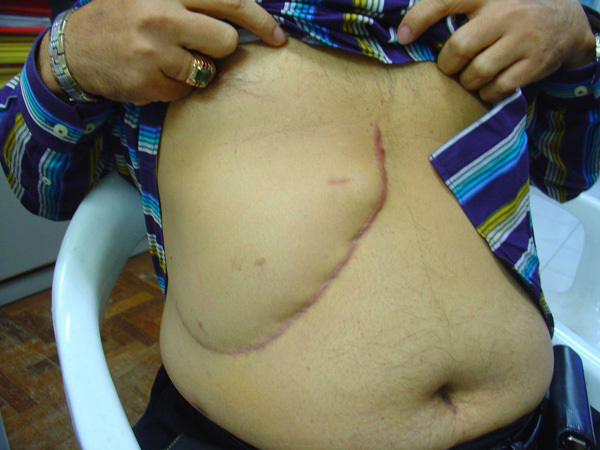 Then he came to Penang and underwent a liver surgery. The situation got worse. As of March 2009, Sam’s AFP has exceeded a quarter million. 3. When Sam tried to seek clarification with the surgeon, he was snubbed. The surgeon did not even want to talk to Sam and his wife. Sadly, patients like Sam were left in a limbo. Sam was then passed on to another doctor. • Nexavar only increased survival by 2.8 months. No where in the website does it ever say Nexavar cures liver cancer. 5. If ever there is anything we can learn from this story, it is this: Ignorance can kill. For years, we at CA Care, have been trying to empower patients by providing them with knowledge. However, patients are not interested to read or find things out for themselves. Far too often, patients prefer to find an easy way out and remain ignorant. And then when they reach this desperate end stage they would say to us: Oh, but we do not know all these. We trust the doctors. Note: In mid-April 2009, we were informed that Sam died. Sam was operated on in October 2008 and by April 2009 he was dead. That was just six months after surgery. What do you think has hastened his death? The surgery or his cancer? What could have happened if Sam did not do anything? Read the various case reports in this website. Doris died 8 months after her liver surgery in Singapore. Suria’s liver cancer recurred 3 months after surgery. Pang suffered recurrence of his liver cancer 5 months after surgery. On the other hand, Mac and Gan refused any medical treatment in spite of having a larger tumour in their livers. And they both lived more than 2 years. Seam had a 9 x 10 cm tumour in her liver and she is still alive as of this writing (after 5 years).